The Interwebs is my business and I spend my working day strategizing how to best use social media for my clients and myself. My hours are split between creating content, scheduling, and analyzing. Add to that a constant need to self-educate on the latest and greatest in marketing, social media, and small business - and it's damn near impossible to unplug. 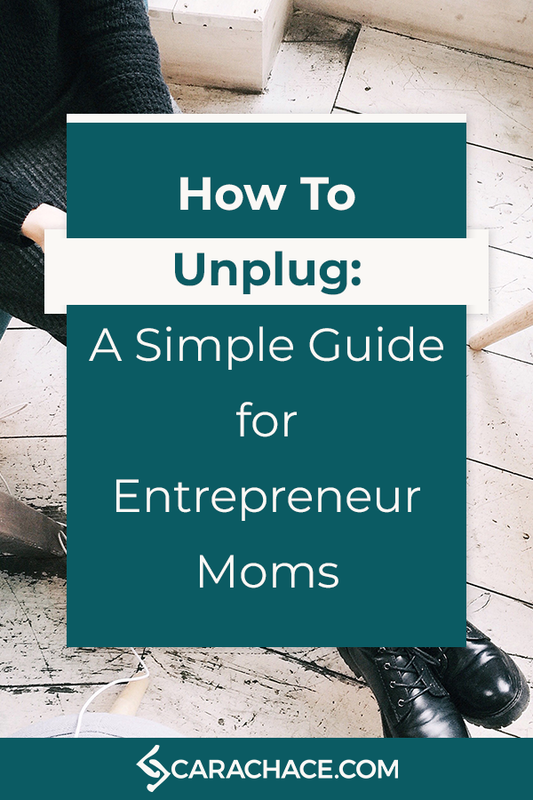 By unplug, I mean doing far more than turning my cell phone to silent. My sense of overwhelm got to the point a few weeks ago that I was dreaming about writing out my to-do list. I would wake up when my toddler came crashing in our room around 6:30 AM, and immediately start checking my emails and notifications. I gave up any aspirations of morning meditation or easing into my day when my kiddo was born - and that will be the case for several more years. Most of the how-to guides I come across in regards to taking time for myself involve this mythical and restorative alone time - gazing out the window with a still hot cup of coffee - and it makes my eyes roll so hard they might someday pop out of my head. Every time I have tried to get up 20 minutes earlier than I think my kiddo will get up, some inexplicable mama connection means said toddler wakes up earlier too. So, we get up and start the morning chaos of preschool life. The favorite shirt isn't clean. Socks feel funny on their feet. You didn't let them turn on the bathroom faucet by themselves. You cut up fruit instead of leaving it whole. You left the fruit whole instead of cutting it up. You didn't let them climb in the car seat on their own. ....and let's not even get into music issues on the way to school. During all this, I usually have one eye and one hand on my phone, trying to get done every smidge of work and admin tasks I can that don't require sitting down at my computer. This is the plight of every small business owner that has more to do than hours in the day. Squeeze in a text here, and email there. All whilst telling my toddler to get their shoes on 50 bajillion times. While my business plan is moving towards more products than service, right now service is my bread and butter. This means clients are calling, emailing, texting, etc - and I sometimes feel pulled a million different directions and completely unproductive. Different project management tasks were swirling around in my head, I was living on coffee and crackers, and sleep was down to around 6 hours a night. I was frazzled, irritable, and hungry. I was bouncing from one half-finished task to the other - interrupted constantly by emails, texts, the kiddo/hubby, the dog, etc. I had put on my calendar several weeks before that I was going to go hang out with a friend I hadn't seen in quite some time, during the middle of the week. We touched base the beginning of the week, and I shoved down the feeling of to-do panic and confirmed. Her house is about an hour away and I knew I needed to make arrangements for the kiddo and client work. I stayed up until midnight for two nights before my getaway day preparing to be out of the office for the whole day. I told my clients I'd be unavailable (gasp!) and scheduled every single social media post for several days ahead. I got up in the morning, got the kiddo to school, swung by the store to pick up supplies (read: mimosas), and hit the road. My friend and I caught up, we chatted, we laughed, we pontificated, we pow-wowed, we lunched, we shopped, we compared notes, we solved all the world's problems. The entire day I didn't so much as unlock my phone. Several times I turned on the screen to make sure there were no emergency family calls, but I literally didn't so much as open a single app. I came home, went to bed early, and woke up the next day after 7.5 (again, gasp!) hours of sleep feeling refreshed, happy, and ready to take on the day. It was everything I thought it would be and more. You hear the advice about taking time for yourself and unplugging, but it's not until you reach that breaking point and experience the difference taking the time to unplug actually makes, that it sinks home. So, dear mama - how are you supposed to do this on a consistent basis when you are juggling home, family, and business? One minute at a time! Start with a few minutes. At the top of every hour, go to Do Nothing For 2 Minutes - you must sit, zone out and listen for 2 whole minutes. If you move your mouse or touch your keyboard the timer starts over. The first 30 seconds feels like an eternity of thinking about all the things you should be doing instead. Then your mind shifts, you calm down, and it's over. You're then prepared to wrap your head around the next task on your list. Your two minutes can be using this website, or stepping away from the computer and stretching, or whatever. Take the time to gather yourself without distractions before moving on to the next to do. Move on to 20 minutes. Work on a vision board (or something creative). Organize something (if organizing makes you happy). Above all, it must be something that doesn't involve a digital screen. If you only read on an eReader, go to the library and check out a book. It saves you money and doesn't tempt you to click over to Pinterest. Don't underestimate the power of staring out the window and letting your mind wander. You'll be amazed how solutions to problems seem to magically rise to the surface. You might only be able to start with one or two of these breaks a day. That's ok - you gotta start somewhere. Eat an actual meal sitting at your table with no devices handy. Do any of the 20-minute activities for an hour instead. You might only have time to take a true hour-long break a couple/few times a week. Again - that's ok.
Go explore a new town, beach, etc. Take a creative class like photography basics or painting. Seriously mama - either go somewhere alone, go visit a friend, or take a family day trip. You might have to do more work on the front-end to prepare, but holy cow will you reap the rewards. To reiterate - these are not activities to be done while you have one eye on your phone, innocently checking Facebook to see who liked your picture from yesterday. These are activities to be done with your phone on silent (not vibrate), away from your computer or any other digital screen. Yes, you'll need to glance at your phone to make sure there are no calls from the hubby or school, but you don't need to go further than that. Your fingers will itch to do so - don't do it. DON'T. If I tried to shower in the morning during the chaos, it either wouldn't happen or my shower would be all of 5 minutes. By showering at night, I take as long as I damn well please and it helps me transition to the calm of the evening - even though I usually have more work to do. I make evenings with my family the priority. All my clients know I am unavailable from around 4:30 PM to 7:30 PM - period. That is my time with my family without any other demands. I try to have a few nights a week where I shut down the computer and phone at a reasonable hour (like 8 PM). Even if I turn on the TV, I make a conscious decision to be done with work for the day - not Tweeting while I'm watching The Walking Dead. Short of a client's accounts getting hacked and their Facebook page having d*ck pics all over it, everything can wait. Here's the beauty of being a work from home mom - you have more demands on your energy and time than you can handle - yet your schedule is more flexible than you'd ever get with an office job. Need to take half a day to drive to the beach while the kids are at school? Doable if you plan for working before or after. Need to walk around your neighborhood at 1:45 PM to get some fresh air and let you mind wander? Totally doable. You most likely decided to work from home because you craved the flexibility and being able to prioritize your family. It is so easy to get sucked into working every waking minute to make it all happen, and phones/computers/tablets have us leashed like never before. If you work on the mindfulness around unplugging, you will be calmer and more able to problem-solve without feeling drained and pulled in a gazillion different directions. Don't worry - I'm not some pontificating jackass that is telling you what you should do because I've done a bunch of research. I'm doing this with you, mama - constantly testing and trying new ways to make my life better and happier - to balance all the demands and loves of my life. These are the ways I've found that help me - and I would luuurve it if you'd let me know in the comments any other ways to unplug that work for you. It seems like a lifetime since I wrote this post. Since then we’ve had another little and the demands on my time and energy are exponential, not double. But re-reading this post was fun because I remember the exact day I wrote about, who I was with, and what a difference it made for me.